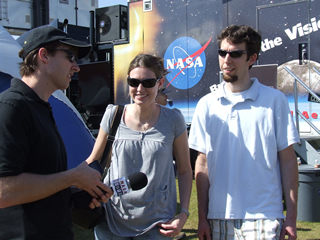 Chris talked to the fans about their knowledge of the Daytona 500 and NASA, and the excitement was amazing. 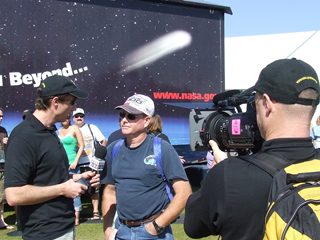 Everyone seemed to know a lot about both NASA and Daytona which led to lots of very cool conversations. This should heat up tomorrow. Astronaut Michael Good is going to be here to answer questions and sign autographs. If I play my cards right, I may even be able to get some insider tips on what I need to do to go to space. Here are a few photos of what we did today. It was very cool to visit the pits during a race. You wouldn’t believe the constant buzz of activity. Each car’s pit felt like a miniture version of mission control during a launch. Ok, so I haven’t been in the control room during a launch, but it is what I imagine it would be like. Anyway, check back late tomorrow night for our final Daytona 500 Post. No comments here? 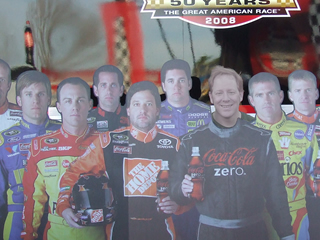 Who could resisit the co-host’s dare to find him in that picture? Didn’t the ‘big zero’ on his suit give anybody a hint? Hahahahaaa! Someday I hope NE@ comes to my town so I can meet you guys in person. Thanks so much. A little bird told me that your show is mostly improv, am I correct? Congrats Chris! With your latest post, you have already written more than we have scripted for an entire year on NASA EDGE. You guessed correctly, we are an unscripted, improv vodcast. I have also noticed that you continue to emphasize that you are not Chris the Host. I’m very suspicious that you may in fact be the Host of NASA EDGE. 3. And in one of your other posts you asked about shirts. The Host isn’t happy unless he has reversible NASA EDGE gear for every occasion. Remember your demand for NASA EDGE argyle socks? No not me. I’ve been working all day. Blair, what have you been doing all day? 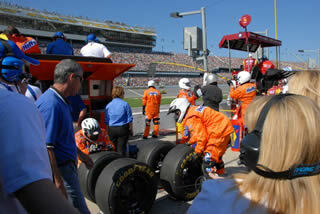 Next Next post: NASA EDGE Wins at Daytona!